UNI is the intuitive and easy to use interface that brings simulation learning experiences to life. 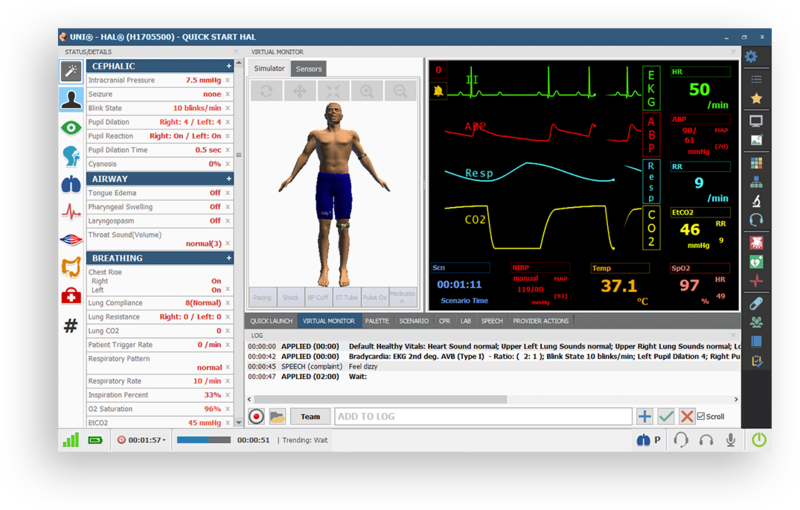 Included with each high fidelity simulator, UNI controls the patient simulator’s physiology, monitors the participants’ actions, and supports data-rich debriefing. UNI’s powerful platform helps you create realistic learning experiences for participants of all levels. quick and hassle-free. One tablet to rule them all. never miss a learning opportunity. Quickly and easily incorporate simulation into your programs. 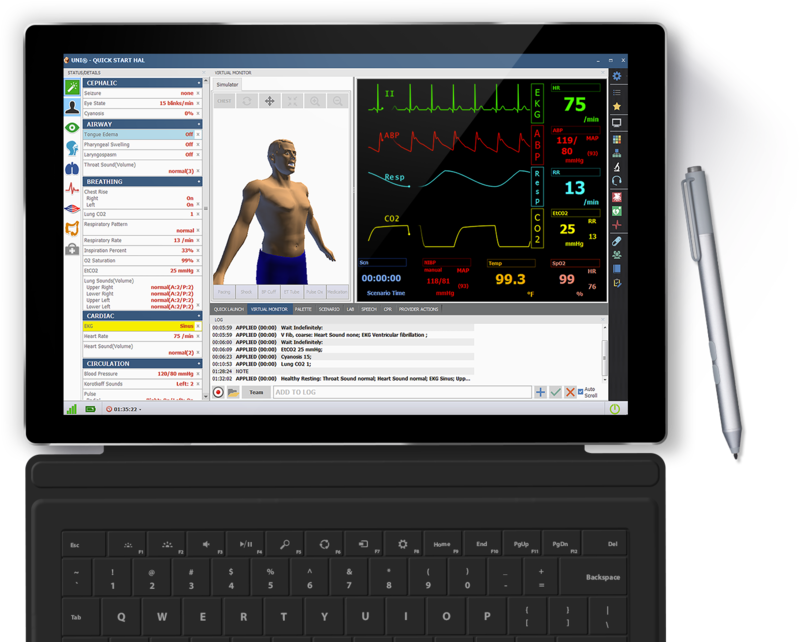 UNI comes preconfigured on a tablet PC and includes a library of modifiable, prebuilt scenarios to save you time and development resources. Create scenarios tailored to your learning objectives and offer participants a wide range of standardized, repeatable learning events. UNI is optimized for wireless and tetherless technology to help you create a fully immersive environment. Select from a library of prerecorded speech items or be the voice of the patient with wireless streaming audio. Illustrate heart damage due to myocardial infarctions that can be detected by a real ECG monitor. An interactive model of the heart allows you to create the occlusion point and customize the age of the infarction. Select from a library of ECG rhythms and adjust waves to create complex rhythms that accommodate your learning objectives. Display your custom rhythms using real ECG monitors or print to share with participants. Generate and control contraction frequency, intensity, and duration to allow participants to assess the well-being of the fetus. Monitor rate and depth of compressions, no-flow time, ventilation rate, and excessive ventilation. Generate performance reports to evaluate the participant's progress over time. Vital sign changes and interventions are automatically recorded to ensure that important events are always captured. The interactive Provider Actions feature lets you carefully track individual or team actions to generate a more detailed and comprehensive post-simulation log. Easily create interactive checklists to track participants' progress to ensure that learning objectives are met. This real-time 3D view of the patient ensures you never lose track of provider-patient interactions during the simulation. 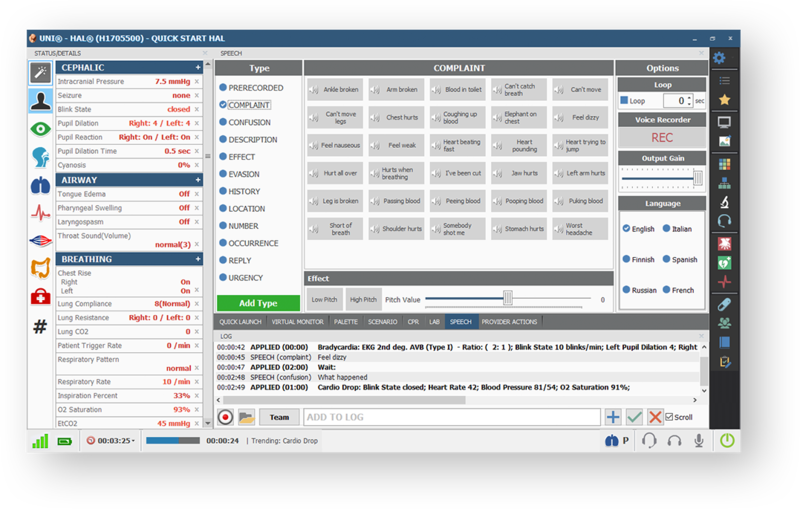 Incorporate the optional Virtual Bedside Monitor to help students learn vital sign documentation and monitoring. Create, print, and share simulated diagnostic lab results to increase participant immersion and involvement. Easily share files and lab reports with the Gaumard Virtual Monitor to enhance the development of clinical reasoning and decision-making skills. 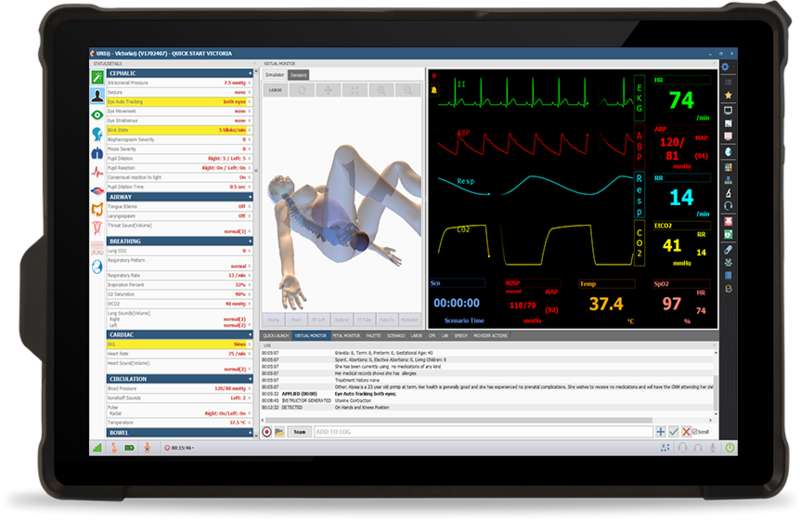 Incorporate the optional Virtual Patient Monitor to help students learn vital sign documentation and monitoring. 1. Speech is only available for pediatric and adult simulators. Neonates can cry and grunt. 2. The Myocardial Infarction Designer feature comes standard in HAL® S3201 and S1020. It is offered as anoptional feature for adult HAL® simulators: S1000, S3000, S3040.100, S3040.50, and S3101. 3. The ECG Designer feature comes standard in HAL® S3201 and S1020. It is offered as an optional feature for adult HAL® simulators: S1000, S3000, S3040.100, S3040.50, and S3101. 4. Labor and delivery features are only available for obstetric simulators. 5. 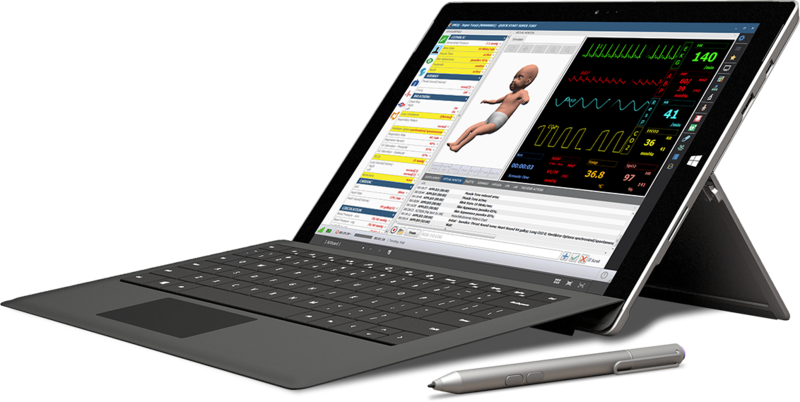 Fetal Monitoring is only available for obstetric simulators and is a virtual feature for NOELLE® simulators: S554.100 and S574, and S574.100.